Is your connector easily customizable? Each connector has a setup record in NetSuite where you can make changes and automatically sync the connector with the setup record. Do your connectors export item feeds from NetSuite to multiple Marketplaces and Webstores? Yes, our connectors will export the item feed from NetSuite to Marketplaces and Webstores on a daily basis. Connectors will export the item feed whenever the item gets created or updated in NetSuite. How frequently does the inventory get updated to the Marketplaces and Webstores? Our Connectors export the inventory feed every 30 minutes. How frequently do orders get imported into NetSuite? The orders are imported into NetSuite every 15 minutes. Are shipments updated to Marketplaces and Webstores? Yes, shipments are exported to Marketplaces and Webstores at regular intervals. Can we import reports from Marketplaces and Webstores? Yes, we import reports based on schedules. Can we import the item feed from your connector to NetSuite? 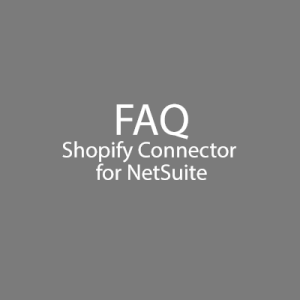 Yes, the connector will import the item feed from Webstore to NetSuite. Does your connector support import returns? Yes. It supports import returns.